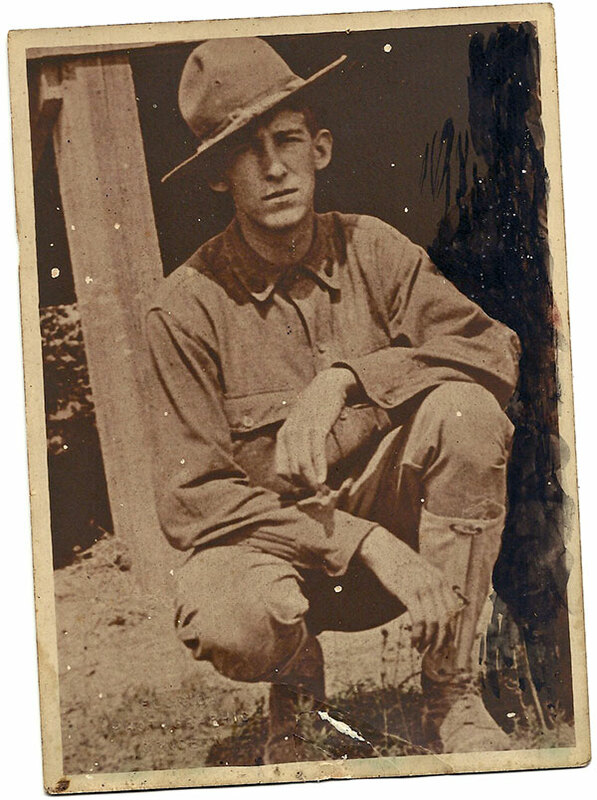 This photo of Stephen N. Gladwin, after whom the Fort Pierce American Legion post is named, is apparently the only photo of him that survives today. 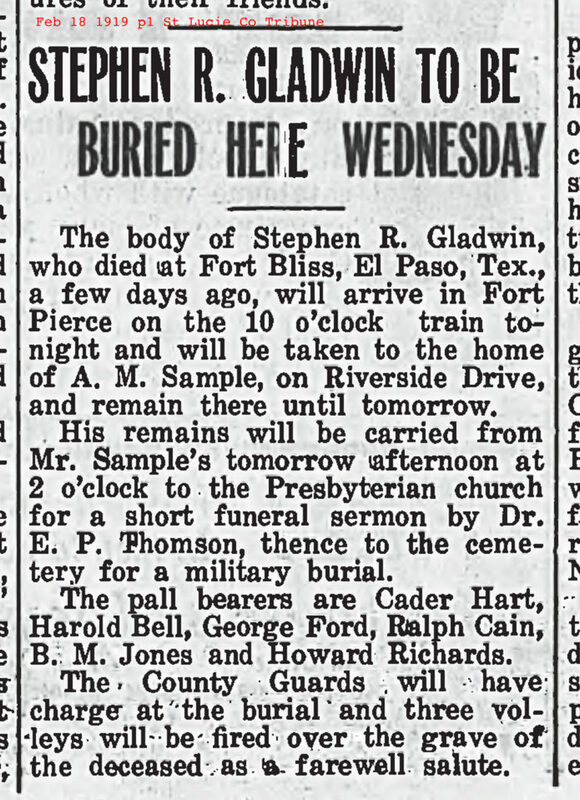 The name Stephen N. Gladwin was a familiar one to me growing up in Fort Pierce. This monument to veterans who died or were killed in the World War I era went up at the St. Lucie County Courthouse shortly after the war and still stands today. 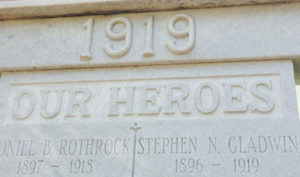 At the top right is the name of Stephen N. Gladwin, the first World War I soldier whose funeral was held in Fort Pierce. I first saw the name etched in the World War I memorial monument on the grounds of the St. Lucie County Courthouse, undoubtedly after seeing a movie at the Sunrise Theatre across the street. My dad pointed out the monument one day and though he probably said exactly how he was related to us, for years we just knew him as “one of our relatives.’’ Whenever we congregated around the monument after movies, I’d often boast that I was related to the name on the top right of the memorial. The local American Legion Stephen N. Gladwin Post 40 also carries his name, and by extension the American Legion baseball teams the post sponsored over the years. At graduation from high school, I received something called the American Legion School Award from Stephen N. Gladwin Post 40, a bronze medal that has been long since lost. It wasn’t until I was older that I realized exactly how Stephen Gladwin was connected to me. He was the older brother of my grandmother, Margaret Gladwin Enns, and of my great uncle, Bob Gladwin, the leader of the local Sea Scout ship with whom I’d grown close over the years. Thus, Stephen Gladwin was the great uncle whom I only knew by name and who had died long before I was born. We did not talk about Stephen Gladwin much in our family. There were never any tales of heroics on the field or a glorified death in battle to share. But I know that he had a special place in my grandmother’s heart — he was six years her senior — because she kept a photo of him on her bedroom bureau. But who he was and why the local American Legion Post was named after him became lost to time. It turns out that both those who survive him by blood, including me, and his brothers and sisters in arms who socialize at the post named for him knew nothing about him. In the course of reporting this story, I reached out to Post 40 for any biographical information they had about him. Nothing. Then I contacted relatives far and wide to find out who he was and why the post was named after him, starting with my second cousin, Stephen Horton of Hurst, Texas, who at 91 is our oldest surviving relative. Stephen’s recollection, though lacking in detail, was more on the mark than the other versions about him that had been passed down. • He had died in a wreck in Texas. • He was the first person from Fort Pierce to die in World War I, and that’s why the Post was named after him. • And, according to Post 40’s own Web site, his family donated land for the post and that’s why it was named after him. It’s funny how an important piece of family or local history can get distorted — like the parlor game of telephone. You start out with a phrase, whisper it around the room and it’s totally changed by the time it comes back around again. 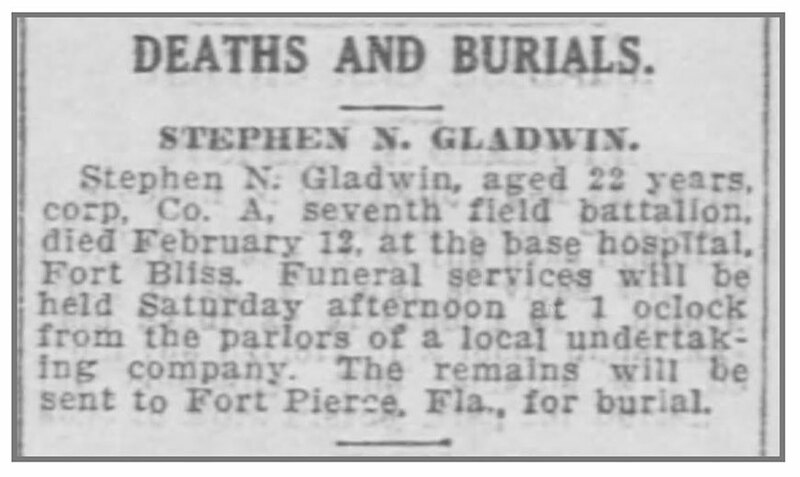 It wasn’t until I visited Stephen Gladwin’s grave at Riverside Memorial Park in Fort Pierce on Memorial Day a few years back that I discovered how badly his legacy in our family had become mixed up. The date of death on his tombstone was Feb. 12, 1919 — three months after the Armistice and the end of World War I. There was no way he could have died during the war. That much was certain. That cemetery visit led me on a long quest to find out who Stephen Gladwin was and how he had lived. I’d often thought that he died some solitary death, away from the small closely-knit community of Fort Pierce he had grown up in and the family who loved him. Except for the naming of the American Legion post, had he died unheralded and forgotten? With the 100th anniversary of his death coming up on Feb. 12, I set out to set the record straight. In the process of searching through newspaper articles, public records and family archives, I not only learned about him but also about my own family’s 118-year history in Fort Pierce. 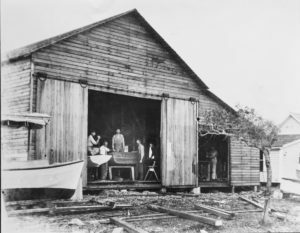 A boat builder, Stephen Nelson Gladwin arrived in Florida from Connecticut in 1878, becoming one of the state’s early citrus growers. 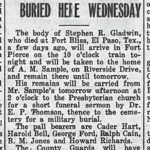 His grandson, also Stephen Nelson Gladwin, would die from Spanish influenza after serving in World War I, with the local American Legion post being named after him. In 1890, ahead of two freezes in 1894 that would move the citrus industry south, Stephen Nelson Gladwin moved his family to Titusville, then the end of the railway line. He soon entered into a partnership in which he ran the region’s first ice company, the Indian River Ice Manufactury, before returning to boat building at the turn of the century. He died in 1909. Stephen Nelson Gladwin’s son, Robert Reed Gladwin, around 1888 became an express agent for the Southern Express Company, a service that transported letters, valuables and other goods over railway lines. In 1895, he married Florence McMeekin of Hawthorne, Fla., who had grown up just 12 miles away from him in Melrose, in Putnam County. They moved to Jacksonville — apparently the most convenient location for his job — and had their first child, Stephen Nelson Gladwin, the soldier, on Nov. 28, 1896, and a daughter, Marion, in 1899. 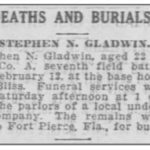 Robert Reed Gladwin, father of World War I soldier Stephen Gladwin, was a railway express agent along the east coast of Florida for 12 years before giving up his job and moving to Fort Pierce in 1901. R.R. claimed to have shipped the state’s first grapefruit from Florida in 1895, when he dispatched two sugar barrels to Savannah. The venture proved unsuccessful, though, after he received instructions on the other end not to ship any more because the people there did not know what they were or what to do with them. Riding the rails as an express agent, R.R. undoubtedly knew what promises South Florida held. By late January 1894, Henry Flagler’s railway had been extended to Fort Pierce, and seven weeks later reached West Palm Beach. By April 1896, it had reached present-day downtown Miami, and R.R. relayed to relatives that he was on the first passenger train that went to Miami over the East Coast Railway. These expansions meant R.R. had spent the 12 years of his career as an express agent witnessing the growth and transformations that would happen in Florida communities as the railway arrived in them. By 1901, R.R., then 31, decided to strike out on his own, leaving his railway job and moving his family to Fort Pierce. His newfound freedom and entrepreneurial drive would lead him through careers as a fish dealer, boat builder and store keeper before finally returning to his family’s roots as a citrus grower. Coincidentally, the move came just two weeks before Fort Pierce, a community of 300 souls, would officially chartered by the Legislature as a city. R.R.’s fish business was known as Price and Gladwin Salt and Fresh Water Fish, according to letterhead a March 9, 1901, mortgage between R.R. Gladwin and James Andrews was written on. The mortgage was for an unspecified piece of property but apparently related to where the Gladwins established their home on the Indian River, just a block south of where the circle at the Citrus Avenue Overpass is today. R.R. 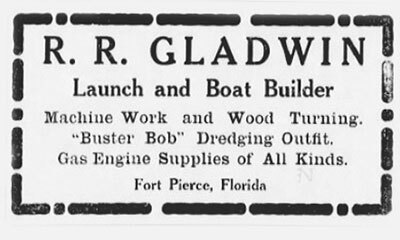 Gladwin built boats during his first decade in Fort Pierce, with his boathouse located at the north side of the mouth of Moore’s Creek. It was later sold to George Backus, father of artist A.E. “Bean” Backus. My grandmother, Margaret Susan Gladwin, was born in Fort Pierce in 1902, and my great uncle, Robert Usher “Bob’’ Gladwin, was born here in 1904. R.R.’s interest in the fish business was soon eclipsed by a boat-building business he had started called R.R. Gladwin, which was located on the north shore of Moore’s Creek, east of where the boat ramps at the Manatee Center are now. The boat-building business was later sold to George T. Backus, father of A.E. “Bean’’ Backus, who would become a well-known landscape painter, and Tod Backus, who would make the boat-building company nationally known. By 1904, R.R. Gladwin had become the young city of Fort Pierce’s first elected mayor. He later served as a St. Lucie County Commissioner after its breakaway from Brevard County in 1905, and he was chairman of the St. Lucie County School Board when the site for the yellow brick school on Delaware Avenue was selected and later oversaw the school’s construction. He also served as president of the Board of Trade, the precursor to the Chamber of Commerce. According to a legal ad appearing in the local newspaper, R.R. 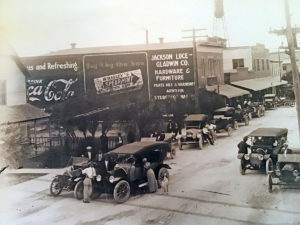 Gladwin with two partners, W.R. Jackson and W.W. Luce, in 1910 formed Jackson-Luce-Gladwin, with each partner owning 20 shares of the corporation. The company operated a hardware store in downtown, which sold everything from furniture to automobiles, according to advertisements of the time. A 1906 ad appearing in the St. Lucie County Tribune touts R.R. Gladwin’s boat-building business. 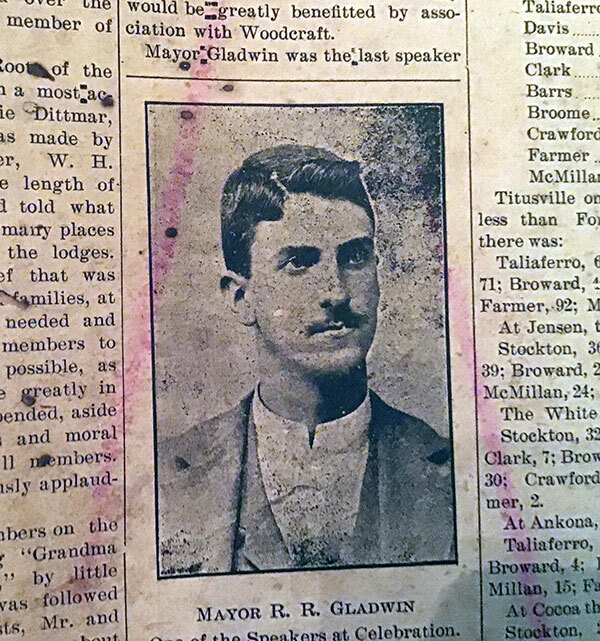 An account from a 1904 newspaper, said to be the oldest known copy of any Fort Pierce newspaper, gives an account of Robert Reed Gladwin’s term while mayor of Fort Pierce. R.R. Gladwin formed Jackson-Luce-Gladwin with two other partners in 1910. By 1915, the company had gone bust, reversing the fortunes of one of Fort Pierce’s most prominent citizens. Much of what I have been able to learn about the family’s early history came from a memoir Bob Gladwin wrote just before his death in 1988. Bob reported that the family’s income during their early years in Fort Pierce was being supplemented by a land deal R.R. apparently made as a railway agent, buying a pineapple field in Biscayne Bay, the site of present-day downtown Miami. Bob said land agents would arrive in Fort Pierce with quit claims for R.R. to sign, and in the process a check would be handed over to his father. Bob Gladwin’s memoirs said that Stephen worked in the Jackson-Luce-Gladwin store and also worked at Mim’s Blacksmith shop and was a volunteer firefighter. Bob also recalled that his brother was mechanically inclined and was good at working on Fords. Stephen was eight years older than Bob, and Bob wrote that he remembered little else about him, except for his generosity as a gift-giver. My grandmother for years kept a vase Stephen had given her, refusing to throw it away even after it had broken, my aunt, Susan Gladwin Enns Stans, recalls. Also passed along in the family was a small table-top bookcase Stephen had hand-built for his mother, Florence. In his memoir, Bob also mentioned a change in the family’s fortunes that altered the family’s dynamic around 1915: Jackson-Luce-Gladwin went bust, with R.R. losing almost everything. Reinventing himself, R.R. bought property in a deal brokered by Rupert “Pop’’ Koblegard at Fort Pierce Farms, north of Indrio Road, where R.R. set about planting citrus groves. The change in fortunes meant that the family moved away from the heart of downtown to remote woods nine miles away, living first in what Bob Gladwin described as a shack until a larger home was eventually built. Stephen Gladwin apparently didn’t make the move to Fort Pierce Farms, with Bob Gladwin writing that the last time he had seen him, he was living at a boarding house on Second Street. My search for documents or newspaper accounts of Stephen Gladwin pretty much end at that time as well. For years, I had assumed that he went straight into the service from Fort Pierce. But another discovery changed that narrative. Stephen Gladwin’s death certificate revealed the cause of his demise as influenza. Besides Bob Gladwin’s memoir, the only family documents my search for family relics related to Stephen Gladwin yielded were a photo of him in his Army uniform squatting, a plaque given to his parents on his death, now owned by my cousin, Stephen Enns, 57, who was named after the soldier, and most puzzling of all — a $1,000 life insurance policy he took out in 1916. 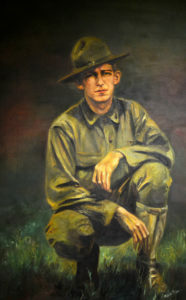 The Army photo, which was later made into a painting by Nataly Nijinsky that still hangs at the American Legion, is apparently the only photo anyone has of him. The life insurance policy from State Life Insurance Co. of Indianapolis — found in a collection of family records my aunt, Susan Gladwin Enns Stans, gave me — yielded far more information than might be expected. An old piece of carbon paper taped to the policy — his medical report — revealed that he was a smoker and a moderate drinker and was in good health, except for a case of malaria suffered during a three-month period at the age of 17. Most interesting of all was that the policy said he was living in Green Cove Springs, a town in Clay County more than 200 miles away from Fort Pierce. Apparently, after graduating from high school, he had moved there. Bob Gladwin’s memoir said that he worked as a chauffeur for a “Mr. Shands.’’ That Shands undoubtedly was Thomas Shands, who had a large lumber company and mill in Clay County. 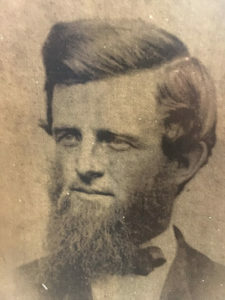 Thomas Shands had a son, William Augustine Shands, who would go on to be a state senator and lead efforts to create the University of Florida’s Shands Teaching Hospital in Gainesville, which continues to bear his name. W.A. 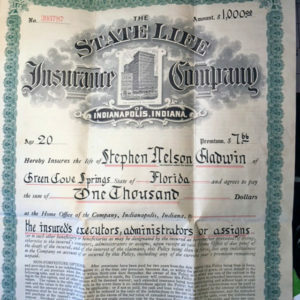 Shands’ draft registration card filled out in May 1917 showed that he sold life insurance for State Life Insurance Co. of Indianapolis — the same company Stephen Gladwin bought his policy from. Apparently, W.A. Shands was a pretty good salesman, persuading his dad’s chauffeur — an unmarried 19-year-old with no children — to buy an insurance policy with an unspecified beneficiary. 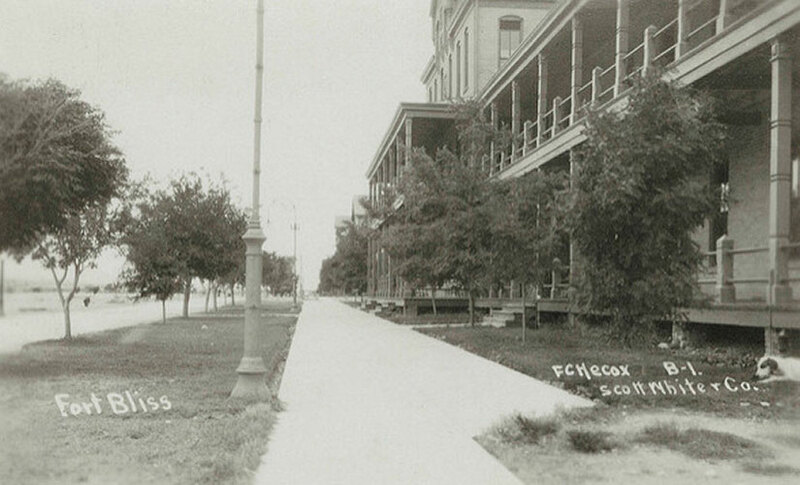 Fort Bliss, near El Paso, Texas, as it appeared in 1916, shortly before Stephen Gladwin arrived as a private. Stephen Gladwin’s Service card shows he was promoted to corporal Nov. 10, 1918, just one day before the end of World War I.
Stephen Nelson Gladwin grew up in a family of military ancestors. His paternal grandfather who shared his name was a Union boat builder and his maternal grandfather, Francis Marion McMeekin, served in the Confederacy and was at the surrender at Appomattox. His great-great-great grandfather, Dr. Robert Usher, fought in the American Revolution. Stephen’s early adulthood was fraught with talk of war. While the United States was neutral when the war erupted in 1914, the country was eventually drawn into it after a series of U.S. ships were sunk by the Germans. On April 2, 1917, President Woodrow Wilson asked a special joint session of the United States Congress for a declaration of war against the German Empire. Congress responded with the declaration on April 6. 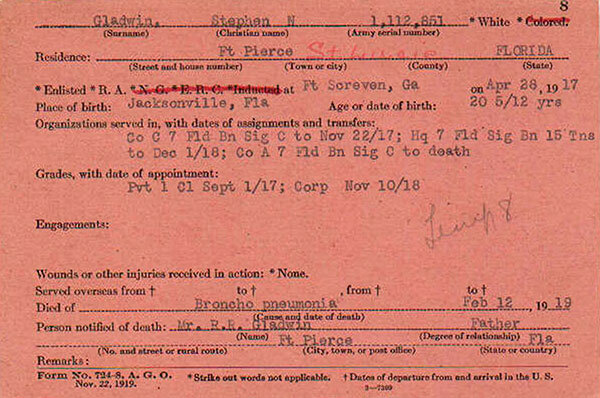 Three weeks later, on April 28, 1917, Stephen Gladwin, 20, enlisted in the U.S. Army, according to his service record. He was inducted at Fort Screven, Georgia, and later transferred to Oglethorpe, Georgia. Then must have come the heartbreak and the direction that would seal his fate. Instead of being sent overseas, he was assigned to Fort Bliss, Texas, as a member of Company A, 7th Field Signal Battalion, for service on the Mexican border. While Mexico was embroiled in civil war, largely over the legitimacy of presidential elections, and officially was neutral in World War I, the United States had cause for concern over its neighbor to the south, as the Germans were working with an exiled former president Victoriano Huerta to overthrow the government of newly elected Venustiano Carranza. While Huerta was arrested in Texas before he could return to Mexico and the plot was foiled, the Germans nonetheless tried to persuade Carranza to go to war with the United States, and in return Germany would help Mexico regain the states of Arizona, Texas and New Mexico that were lost in the war of 1847. Though he formed a commission to consider the offer, Carranza eventually refused. 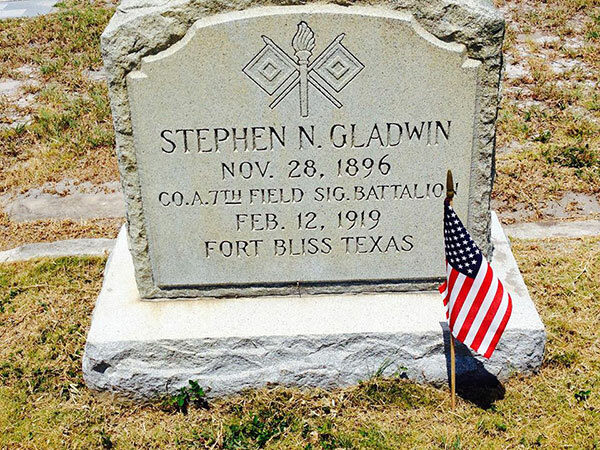 Against this background, during his service on the Mexican border, Stephen Gladwin “was repeatedly under fire at Nogales, Arizona, during a two days battle with the Mexican banditti, Germany’s paid agents against the United States,’’ his obituary stated. 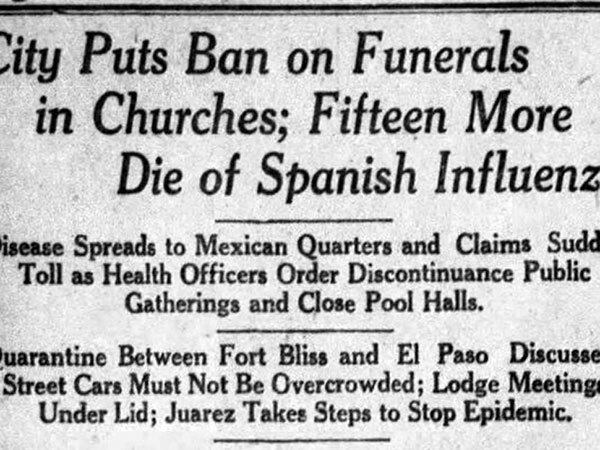 An El Paso newspaper shows how virulent the Spanish flu epidemic had become, with the city banning funerals. Flu victims receive treatment in great numbers at Fort Riley, Kansas, during the 1918 Spanish influenza epidemic. Stephen Gladwin survived that battle at Nogales and perhaps others, but what he faced back at Fort Bliss was deadlier. 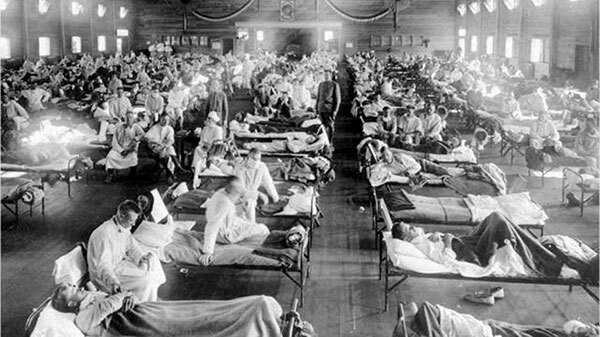 The Spanish flu, which would kill far more people than war, had arrived in El Paso, where Fort Bliss is located, in September 1918. By October, it had spread to such a degree that townspeople couldn’t congregate in public places such as schools, churches or theaters. Even funerals were banned. Soldiers at Fort Bliss were confined to their posts. El Paso was especially susceptible. It had a dense urban core, and Fort Bliss housed soldiers in close quarters and many of them had recently returned from Europe, where the flu had taken hold. In all, the flu had killed more than 600 people in El Paso in 1918. Declared the worst health crisis in human history, the flu claimed a minimum of 21 million lives, with some estimates putting the death toll past 50 million. In all, 53,402 U.S. soldiers were killed in action in World War I while another 63,114 died from disease such as Spanish flu and other causes. But things took a significant turn for the better that November. On Nov. 9, the city’s ban on public gatherings was lifted as the health crisis seemed to abate. And then two days later, the Armistice was declared, ending the war. Pistol shots and whistles awakened El Paso residents early that morning, and celebrations continued throughout the day, including a parade attended by more than 8,000 people. On the personal side, November was also a banner month for Stephen Gladwin. He was promoted from private to corporal on Nov. 10 and on Nov. 28 celebrated his 22nd birthday. What lay ahead was unknown. Would he return home to Fort Pierce to civilian life? Would he continue his military career? Those questions would never be answered. On Feb. 7, 1919, he began receiving treatment for the flu, apparently the victim of a smaller wave early that year. Five days later, at 8:30 p.m., Cpl. Stephen Nelson Gladwin died at the base hospital. 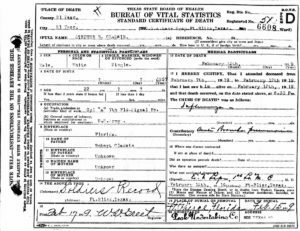 His death certificate attributed the cause as influenza with acute bronchial pneumonia as a contributor to his death. The El Paso Herald reported Feb. 14 that services were held at “the parlors of a local undertaking company,’’ and then the remains were shipped by train back to Fort Pierce. 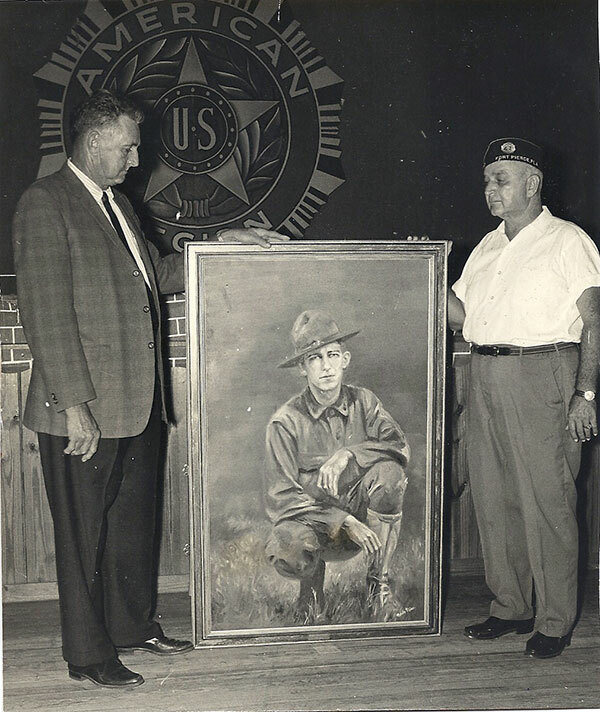 Bob Gladwin, left, brother of Stephen N. Gladwin, was present when a painting of his brother was presented to American Legion Post 40. Stephen Gladwin’s tombstone in the Gladwin/Enns family plot at Riverview Memorial Park in Fort Pierce bears the insignia of his battalion. His 1919 funeral was reported as being one of the largest in Fort Pierce up to that time. 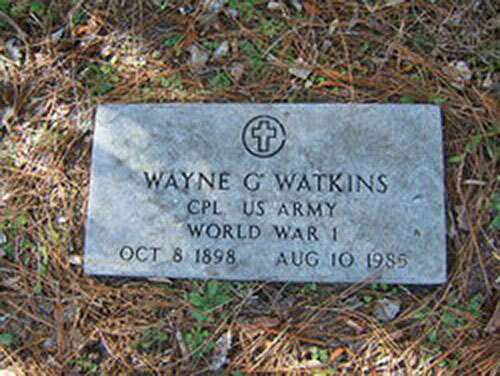 Wayne G. Watkins’ grave in Putnam Hall, Fla. Watkins was the likely bunkmate of Stephen Gladwin, who enlisted with Gladwin when the U.S. declared war with Germany, served with him at Fort Bliss and accompanied his body home by train when Gladwin died of Spanish influenza in 1919. The St. Lucie County Tribune reported that the remains arrived at 10 the night of Feb. 18 and were taken to the home of A.M. Sample for visitation the next morning, “where they were viewed by hundreds of old acquaintances and sorrowing friends.’’ The visitation was held at the Samples’ home for convenience because the Gladwins had moved out of the heart of downtown. 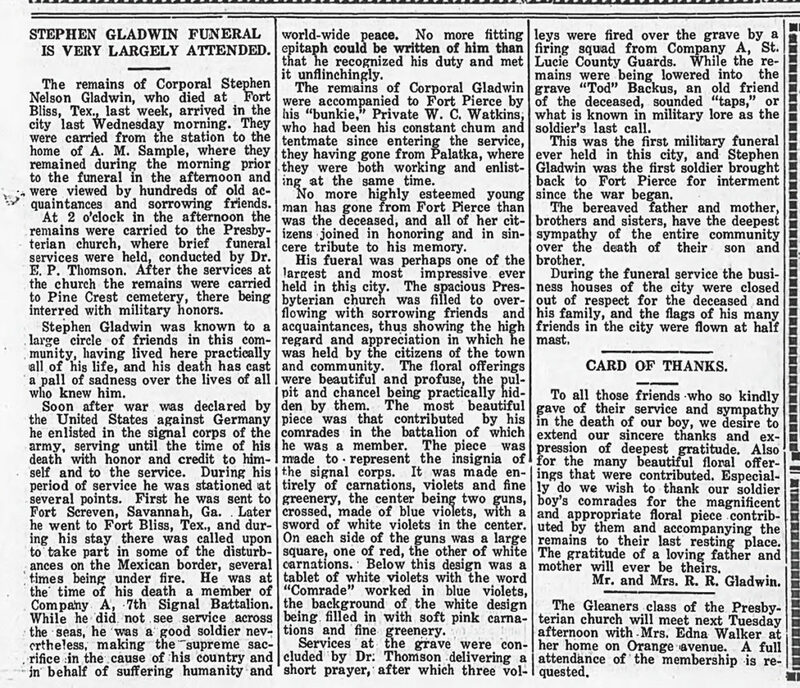 The flag-draped coffin was then carried to the First Presbyterian Church, with a funeral service given by Dr. E.P Thompson. The coffin was then carried to Pine Crest Cemetery, now known as Riverview Memorial Park. The pall bearers, all returned soldiers in uniform, were Cader Hart, Harold Bell, George Ford, Ralph Cain, B.M. Jones and Howard Richards. Businesses were closed during the funeral and flags were flown at half-staff, the St. Lucie County Tribune reported. The newspaper account described the floral arrangements, including one given by the friends in his battalion that was made to represent the insignia of the Signal Corps. Created of red and white carnations, violets and greenery, the arrangement had two guns crossed, with a sword in the center. The word “Comrade,’’ created of blue violets, appeared under the insignia against a background of white violets. At the graveside, Dr. Thomson delivered a short prayer, which followed a three-volley shot fired by the St. Lucie County Guards. As the body was lowered into the grave, Tod Backus, a friend since their fathers’ days in the boat business together, blew “Taps,’’ the soldier’s last call, on his horn. The newspaper account settled the question of Stephen Gladwin’s place in Fort Pierce history. While others had died or were killed in war, none had been brought home for burial. In an age before radio or television, the funeral with military honors must have been the city’s biggest spectacle, an event that would remain etched in the minds of citizens for years. R.R. Gladwin’s early prominence in the city made it all the more significant. So it was inevitable that when the local American Legion post was formed in Fort Pierce, the citizenry chose to name it after the man the city had just memorialized. Tommy Gladwin stands by a 1952 Ford tractor he keeps in running condition at one of his barns west of Fort Pierce. 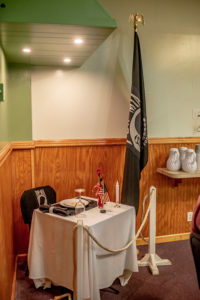 The account of the flower arrangement from his brothers in arms in Texas settled the question of whether he had died alone and unconnected. But also did a surprising reference in the newspaper accounts that we never knew about. He had a best friend with whom he’d enlisted and served and who had fulfilled the extraordinary mission of accompanying his remains from Fort Bliss to Fort Pierce. 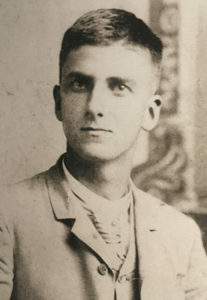 “The remains of Corporal Gladwin were accompanied to Fort Pierce by his ‘bunkie,’ Private W.C. Watkins, who had been his constant chum and tentmate since entering the service, they having gone from Palatka [near Green Cove Springs], where they were both working and enlisting at the same time,’’ the St. Lucie County Tribune reported. In my search, I could find no W.C. Watkins from Palatka who had served in World War I, nor a “Wayne Watson’’ that was referenced as Stephen’s bunkie in the competing newspaper. But I did find a W.G. Watkins — Wayne Goodman Watkins — whom I have concluded was his tentmate. W.G. Watkins was from Putnam Hall, Florida, 20 miles from Palatka, and had an enlistment date three days before Stephen Gladwin’s. W.G. Watkins was released from service Aug. 1, 1919, and would go on to marry and have two children. He died Aug. 10, 1985, at the age of 86 and is buried at Paran Baptist Church Cemetery in Putnam Hall. Besides parents R.R. Gladwin and Florence, Stephen left behind siblings Marion, 19, Margaret, 16, and Bob, 14. R.R. Gladwin went on to successfully cultivate his citrus grove at Fort Pierce Farms and served on the Committee of Fifty, the predecessor to the state’s citrus commission. He died in 1942 and Florence died in 1948, several months after a fire had destroyed the family home at Fort Pierce Farms. Tommy Gladwin’s blacksmith shop, created from tools from Mim’s Blacksmith Shop, where his uncle, Stephen Gladwin, had worked as a youth. Marion would go on to marry Eugene Horton and have three children: Stephen, Mary Jean and Florence. Marion died in 1933. In 1926, Margaret married my grandfather, E.R. “Putz’’ Enns, who arrived in Fort Pierce in 1923 from Kansas to manage his family’s citrus grove. 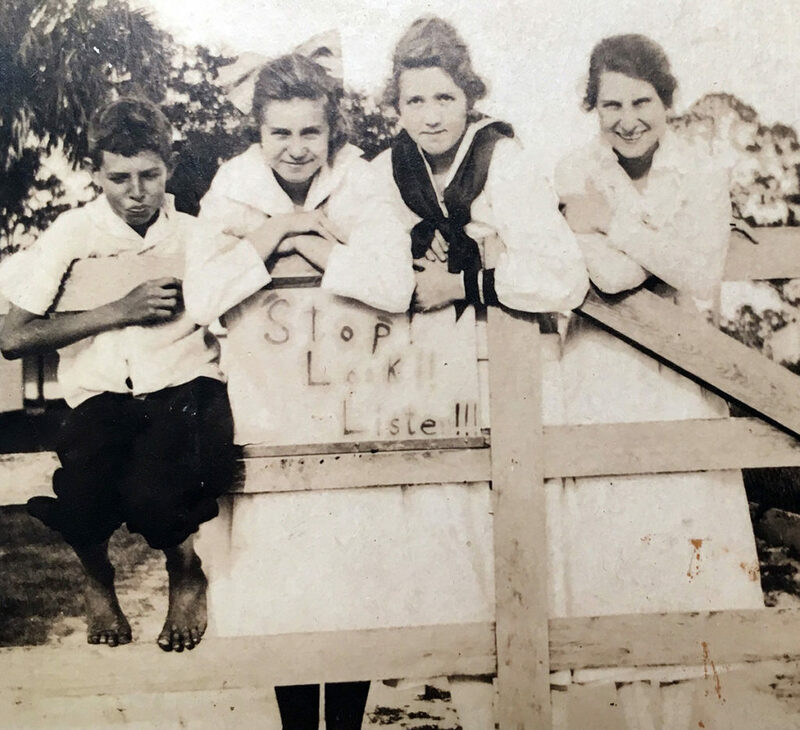 They had three children, my dad, Bob Enns, who became the editor of the local News-Tribune, my uncle, Edward Gladwin Enns, who served as a mayor and St. Lucie County commissioner, and my aunt, Susan Gladwin Enns Stans, an anthropologist and the last surviving sibling who now lives in Atlanta. Margaret Gladwin Enns died in 1984. In the course of reporting this story, I had the pleasure of reconnecting with relatives — my second cousin Stephen Horton and another second cousin, Tommy Gladwin, whom I hadn’t seen in several years. Because Stephen lives in Texas, I communicated with him by phone and email. For my reconnection with Tommy, 66, who is the last of our male relatives with the last name Gladwin still living in Fort Pierce, I drove out to his home west of town. Arriving at his place in the country and seeing the endless barns he had built over the years packed with jeeps, trucks, cars and tractors he was tinkering with, I was reminded of his father’s own industriousness and how that was a Gladwin family trait. Though we don’t share the same last name, my side of the family keeps the Gladwin connection going in its own way by giving various members of our family Gladwin for their middle name, including two of my own children. We also have a relative, my first cousin, Gladwin Enns, 54, who has Gladwin as his first name. His 23-year-old son also goes by the name Gladwin Enns. During my visit to Tommy’s home, he showed me a blacksmith shop he had built and outfitted with equipment the late Charlie Crooks had given him from Mim’s Blacksmith Shop, where his Uncle Stephen had worked. Tommy’s wife, Kathy, versed in our family’s history as well as any blood relative, easily retrieves family documents on virtually any topic we discuss. 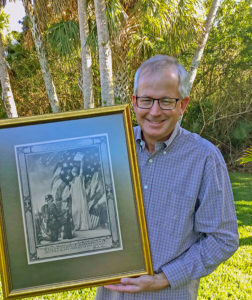 She shares the story of how their 11-year-old grandson, Cooper Thompson, recently gathered people around the World War I monument across from the Sunrise Theatre to boast of his relationship to Stephen N. Gladwin. Maybe “our soldier boy’’ won’t ever be forgotten after all. This image of Stephen N. Gladwin, painted by the late Nataly Nijinsky several decades ago, is based on the only known photo of him. As 4 million U.S. soldiers returned home from World War I after the Armistice was signed Nov. 11, 1918, many of those greeting them wondered how to acclimate them to civilian life once again. 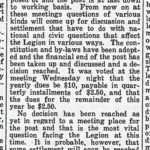 Congress on Sept. 16, 1919, chartered the American Legion as a patriotic organization to serve war-weary veterans, and many local posts were formed in towns across the United States. 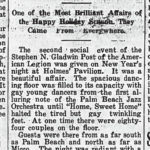 The Fort Pierce post formed just weeks after the Congressional declaration, with the St. Lucie County Tribune on Oct. 10, 1919, reporting that the Stephen N. Gladwin post had been formed and was planning a celebration on Nov. 11 for the one-year anniversary of the Armistice. 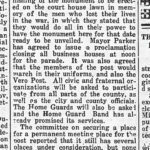 The post also discussed the establishment of a monument on the grounds of the St. Lucie County Courthouse, an action that became a reality — the monument still stands on the courthouse grounds today. The Tribune reported on Oct. 17, 1919 that the organization’s constitution and bylaws were adopted, with yearly dues of $10, payable in four installments of $2.50. Today, the Stephen N. Gladwin Post 40 of the American Legion continues that tradition, with activities planned for nearly every night of the week for the 400-member veterans the post serves. With a 2,400-square-foot social hall at 810 S. U.S 1 in Fort Pierce, the post on Sunday features breakfast in the morning and bingo in the afternoon, Monday offers “King of Diamonds’’ card game, Tuesday is dinner and dancing with live music, Thursday features the “Show Me the Money Card Game,’’ Friday is for the weekly Fish Fry and Saturday is karaoke night. The post’s large, comfortable bar is also popular. “We’re a good hangout when people just want to come and have a beer,’’ says Donna Sandall, the post’s historian. A memorial in a quiet corner at Stephen N. Gladwin Post 40 honors those soldiers who are missing in action. In addition to providing a social space for veterans, the post also assists in fund-raising for local charities, helps raise money for scholarships for the Boys State program and has provided assistance to Eagle Scouts for various projects, Sandall says. 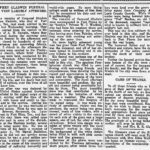 Though newspaper accounts from 1919 say the post was formed that year, post officials say they won’t celebrate the post’s 100th anniversary until 2024, because the post wasn’t officially chartered until 1924. Sandall, who is new to the job, says few records exist regarding the post’s early history, including any biographical information it might have on the post’s namesake, Stephen N. Gladwin, who died in service three months after the end of World War I. A painting of Gladwin, completed in the 1960s by the artist Nataly Nijinsky, hangs over the social hall. 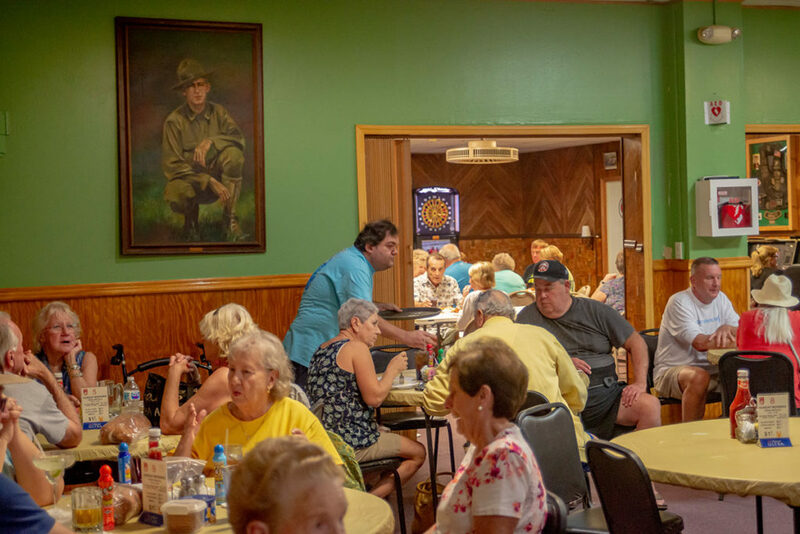 Bingo is just one of the activities scheduled nightly at American Legion Post 40.